As experiments continue on ground-based packet radio local area networks, a new class of satellite is being considered to handle linking of both individual ground stations and local area networks. The PACket radio SATellite (PACSAT) system is designed to provide a store-and-forward digital repeater which is available to all groups around the world for fully global network coverage. The satellite provides this coverage by occupying a low-earth orbit (LEO ), which has several benefits. The close proximity of passage, relative to geo-synchronous satellite, allows easy access, with good "link margins". There are thousands of amateur radio earth stations that are already configured to operate on this class of satellite. Additionally, proper choice of orbital parameters allows a sun-synchronous orbit, where passage of the satellite occurs at the same times each day, providing an easy means of scheduling transmissions. This orbit then provides both 100% global coverage and very fair access, and creates a powerful new use of a well-known class of amateur satellite. There are several reasons for providing such a system in the Amateur Satellite Service. PACSAT will be a widely available vehicle for advanced amateur radio experimentation, as well as a prototype system for a new class of satellite service -- reliable transmission of data to remote sites and isolated users, regardless of location. It will also provide a new form of emergency communication -- a reliable, highly available link compatible with global mobile and portable radio service requirements. The PACSAT project will provide AMSAT with a new supply of engineering talent and expertise, fresh sources of funding and new ranks of members. 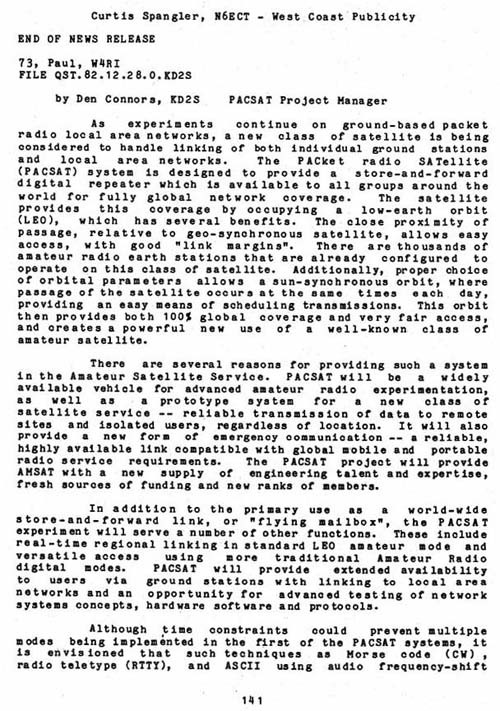 In addition to the primary use as a world-wide store-and-forward link, or "flying mailbox",	the PACSAT experiment will serve a number of other functions. These include real-time regional linking in standard LEO amateur mode and versatile access using more traditional Amateur Radio digital modes. PACSAT will provide extended availability to users via ground stations with linking to local area networks and an opportunity for advanced testing of network systems concepts, hardware software and protocols.